The Course Home Page is the first view your students will see when they enter your course. For the Course Home Page, you can customize a page from your course Pages and have it display as the Course Home Page. If you want to change the Course Home Page to a custom page, you must first set the page as the Front Page. The Front Page is a designation that shows Canvas which page can be used for the Course Home Page. Use this page to show a welcome message, links, images, or other information for students. Before setting the Front Page, the page must be published. You can edit the Front Page, set a different page as the Front Page, or remove the Front Page. Before setting a Front page, the Pages link in Course Navigation will open to the Pages Index. However, once you have selected a Front Page, the Pages link will always open to the Front Page. To return to the Pages Index, click the View All Pages button. The Pages Front Page can also be set to display recent course announcements. Locate your published page that you want to set as your Front Page . Click the Options icon  and select the Use as Front Page link . The Front Page will be indicated by a gray Front Page tag . 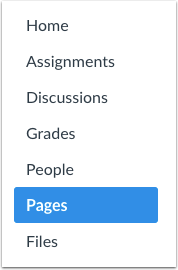 You can change the Front Page to any other page in the course by selecting the page Options icon . You can also set a page as the Front Page from any individual page in your course. Click the name of any published page that you want to set as your front page. Click the Options icon  and select the Use as Front Page link . To remove the Front Page, locate the page labeled with a gray Front Page tag . Click the Options icon  and select the Remove as Front Page option . Previous Topic:How do I link to other Canvas pages in a course? Next Topic:How do I embed a video in a page in a course? Table of Contents > Pages > How do I set a Front Page in a course? Re: How do I add Announcements to my home page? I already have a selected home page but want to have the current Announcements visible in my Home Page. Re: How do I make Canvas look good?